Oprah Winfrey is apparently coming to iOS, with a new book club format exclusively for Apple devices. 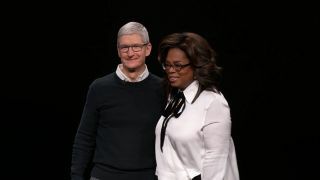 Winfrey was a surprise guest at the end of Apple's launch event on March 25, closing an eclectic list of announcements covering everything from a video game subscription service (Apple Arcade) to the formal unveiling of the Apple TV+ streaming platform. Speaking to the crowd, Winfrey stressed the importance of 'listening' to one another, and praised Apple's global device network for its ability to connect users to each other – but followed up with a teasing reference of 'Oprah's Book Club', the regular literary segment on the Oprah Winfrey Show that ceased back in 2011. She said that "nothing is more gratifying than a brilliant book", and announced the incoming "club" forth "one billion plus strong" network of iOS users – referring to the 1.3 billion active Apple devices in use across the world. Winfrey gave few details – no launch date, pricing, and whether it will be integrated in some way with Apple Books – but it's likely to be some form of app with video or podcast content between Oprah Winfrey and various guests, as they discuss novels and non-fiction books, shortly before Winfrey propels them to global bestseller lists. Oprah's appearance came at the end of a jam-packed launch event for a number of new and updated Apple services, including an expanded Apple News+ platform with a host of digital magazines, and the formal unveiling of the Apple TV+ streaming service. Aside from the difficulty of keeping track of so many near-identically named platforms, Apple is moving a clear attempt to engage with a wider cultural conversation, as a content creator as well as a company that connects users to that content. Oprah's cache as a talk show host and celebrity will certainly be a big draw for people engaging with Apple's iOS ecosystem – even if we don't know exactly what form it will take.